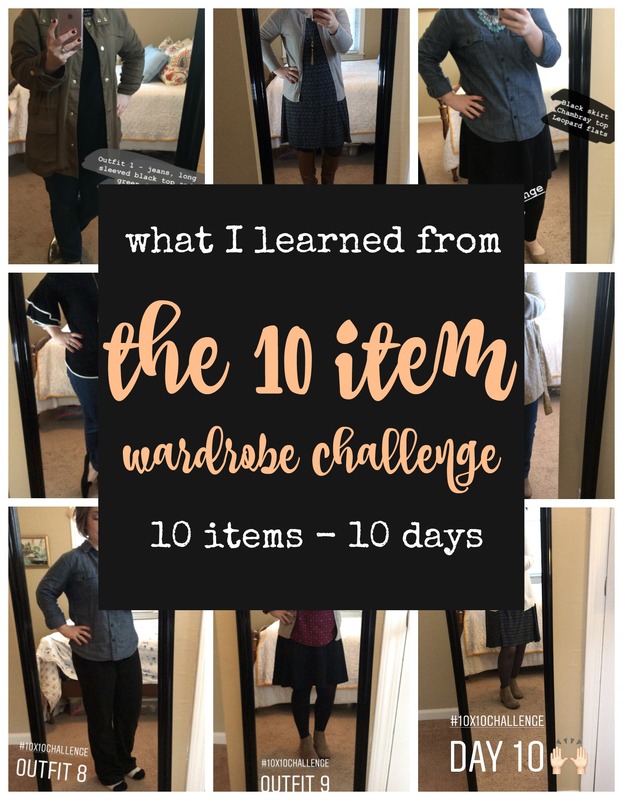 Earlier this month I took the 10×10 wardrobe challenge – this is where you choose ten items to make up your outfits for the next ten days! When my friend Rebekah issued the challenge, I was just tired of my clothes and couldn’t seem to find anything to wear. I’m not sure why limiting my choices was appealing to me, but it was! #1 It forced me to be creative with my outfits! This was a good exercise for me as a lazy dresser. I put things together that I would never have considered before this challenge! #2 It made me content with the things that I had. I couldn’t rifle through my entire wardrobe when getting dressed for the day – I had to choose from the ten pieces and pick something! I found myself looking forward to wearing the other pieces outside the ten items (sort of like rotating a child’s toys!). I was much more excited to wear something I hadn’t “seen” for 10 days. #3 It helped me to refine my wardrobe. The process of choosing the ten items helped me to discover holes in my wardrobe where a few staple items are necessary. I know now that when it comes to clothes, I am not a minimalist! 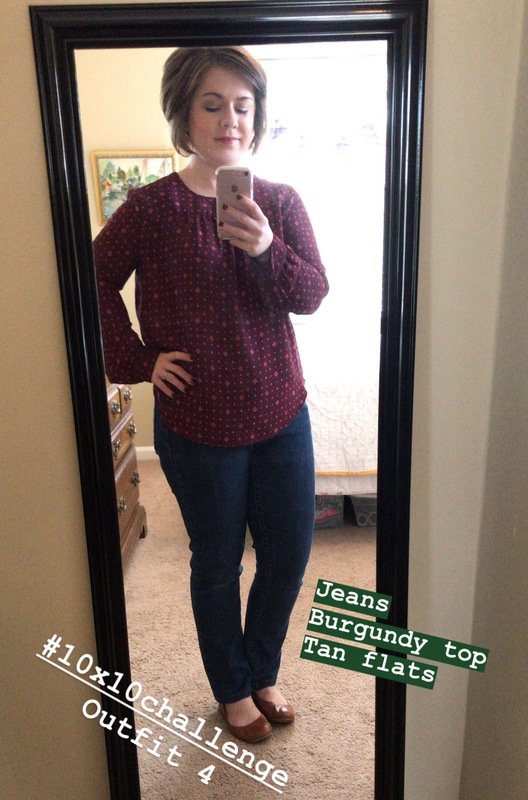 I learned that I like having more than 10 items to wear! 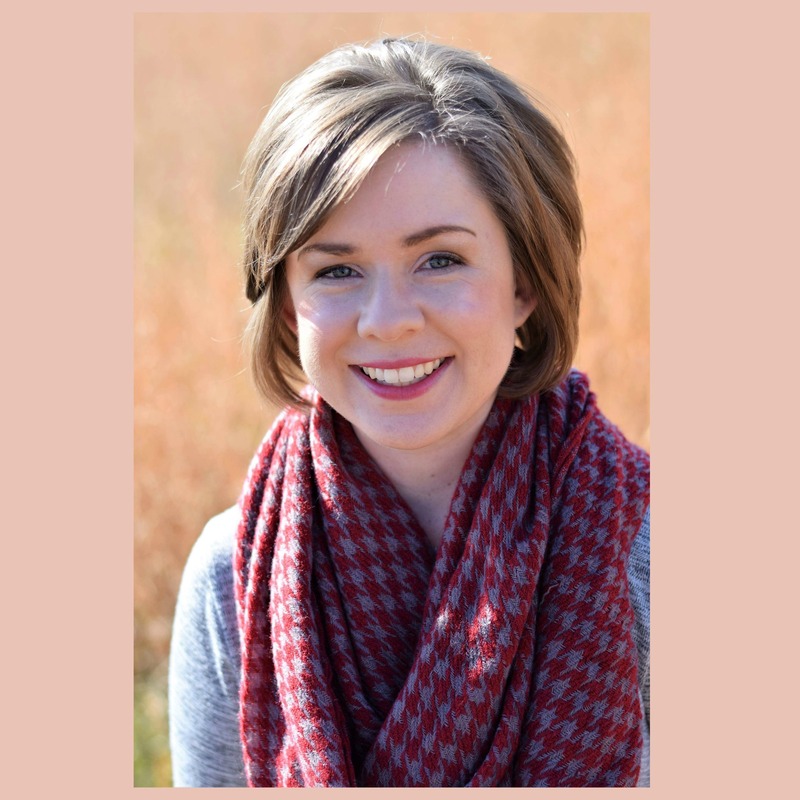 My favorite top was the printed burgundy top – even though I had two black ones to choose from (my usual go-to) – telling me that I need more color in my wardrobe. I showed all of the ten pieces individually and shared each day’s outfit on my Instagram stories. They are still saved in my highlights if you want to check it out over there. 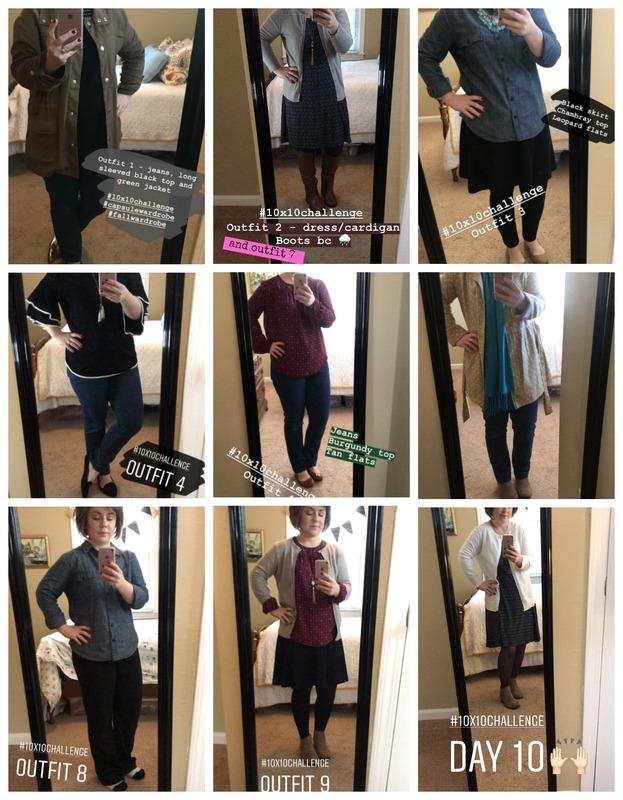 If you’re facing a daily struggle of having nothing to wear, try the 10×10 challenge and see what light bulbs go off for you! I’m constantly trying to edit down my wardrobe to only the things that I LOVE. That way I know that I can reach for anything hanging in my closet and I feel good in it. It’s still a work in progress, but I try to reevaluate at the end of every season. Love that burgundy top on you. Such a pretty color and classic outfit that looks great on you. Thank you! I wish I had a couple more of those tops in different colors or patterns! Whitney, I really like the burgundy top. Where did you get that? I must say you always look so cute and put together. Thank you, Debbi! It is a GAP top, but I picked it up at an overstock boutique here in town. Sometimes I get frustrated because I have too much in my closet too! I think it would be fun to do a capsule wardrobe soon for me! I know what you mean! It’s a great way to decide what you really love, for sure. When we were newlyweds there was no such thing as a walk in closet so our wardrobe choices were limited by storage. :) And really do we need a whole closet full of clothes we only wear every now and then? 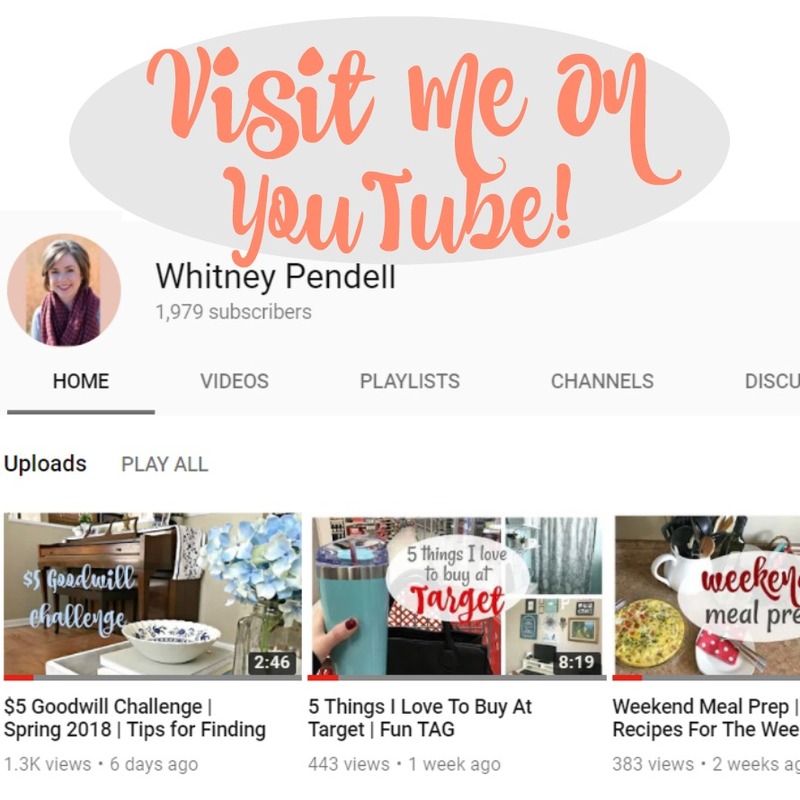 Love this challenge and how you rose to it Whitney. We could all do with some donating and downsizing.